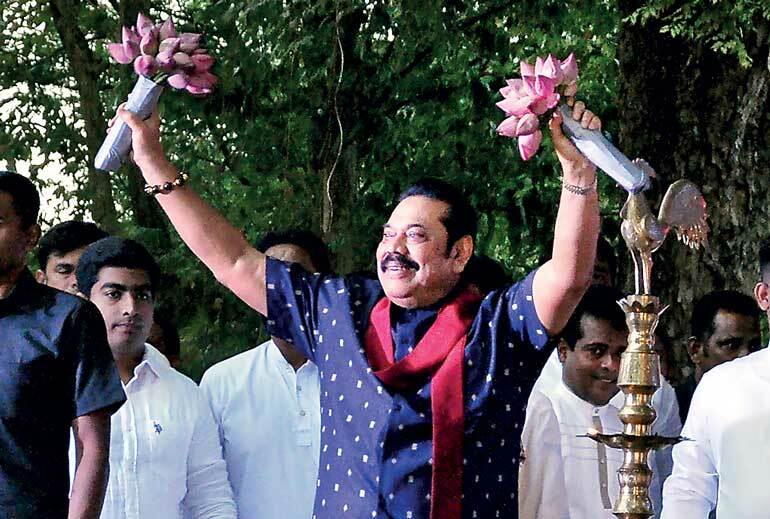 In an unexpected election upset, the Sri Lanka Podujana Peramuna (SLPP) yesterday swept the Local Government polls, winning a significant majority and positioning itself ahead of the United National Party (UNP), United People’s Freedom Alliance (UPFA) and Sri Lanka Freedom Party (SLFP). Colloquially referred to as the “pohottuwa party” backed by former President Mahinda Rajapaksa, the SLPP secured about 222 Local Government bodies including municipals councils, urban councils and pradeshiya sabhas. The Elections Commission did not release a final tally of the results but in-house calculations showed that the UNP won 41 LG bodies and the Illankai Tamil Arasu Kachchi (ITAK) bagged 34 Local Government bodies. The SLFP secured only seven Local Government bodies. The UNP managed to retain its traditional stronghold of the Colombo Municipal Council (CMC) by a resounding margin of 46% while the SLPP managed just 21% of the vote. It also managed to grab the Kandy Municipal Council, Dehiwala Mount Lavinia Municipal Council, Gampaha Negambo Municipal Council, Kolonnawa Urban Council, Mannar Pradeshiya Sabha, Wattala Mabola Urban Council, Badulla District Haputalle Pradeshiya Sabha and Kalutara District Agalawatta Pradeshiya Sabha among others. In terms of districts, the UNP won Nuwara Eliya, Mannar, Ampara and Badulla. The SLPP in its maiden foray into Local Authority polls won the majority of districts including Gampaha, Kalutara, Kandy, Galle, Matara, Hambantota, Kurunegala, Anuradhapura and Polonnaruwa. The party, which was fronted by former President Mahinda Rajapaksa, did particularly well among traditional Sri Lanka Freedom Party (SLFP) stalwarts but fell short of making an impression in the north and east except for Trincomalee where they managed to win. Minority votes for the most part remained with their customary preference of ITAK with Jaffna, Kilinochchi, Vavuniya, Batticaloa and Mullaitivu. This allowed ITAK to round off the top six in the final listing with about 3.04% of the total vote. A reasonable number of the upcountry Tamil population also voted with the Ceylon Workers Congress and announced on Sunday its plans to form a coalition with the SLPP, which would give the latter control over 11 Local Government bodies in Nuwara Eliya it would have otherwise struggled to hold. The move could also pose a challenge to the UNP to hold onto its lead in the district. “Rajapaksa’s electoral performance comes as a surprise and will be problematic for President Sirisena,” political risk consultant Eurasia Group Shailesh Kumar was quoted as saying by Reuters in an analysis of the election result. Poll results triggered round the clock discussions both within the UNP and SLFP as well as between President Maithripala Sirisena and Prime Minister Ranil Wickremesinghe. The UNP parliamentary group as well as their SLFP counterparts will be holding meetings separately today to fine-tune options that have been discussed between Sirisena and Wickremesinghe, party sources told Daily FT.
Former President Mahinda Rajapaksa is also expected to hold a media conference to outline what his next moves may be as he remains an official member of the SLFP despite being the face of the SLPP. His brother former Defence Secretary Gotabaya Rajapaksa announced his return to Sri Lanka today from the US following the successful election result. “The parliament is likely to see defections and Rajapaksa will call the shots,” political analyst Kusal Perera told international media, predicting the pitfall the election result may cause the coalition Government. Softlogic Stockbrokers Research head Danushka Samarasinghe said the results could bring more uncertainty to the market and ongoing economic reforms could be overshadowed by parliamentary politics. The Government had outlined ambitious reform plans both as part of its ongoing program with the International Monetary Fund (IMF) and in Budget 2018 that is likely to be gridlocked by the latest development. Extensive plans to promote reconciliation measures, including drafting a new Constitution, would also be in danger of sliding off the policy platform despite Sri Lanka being expected to give an update before the United Nations Human Rights Council (UNHRC) in March.